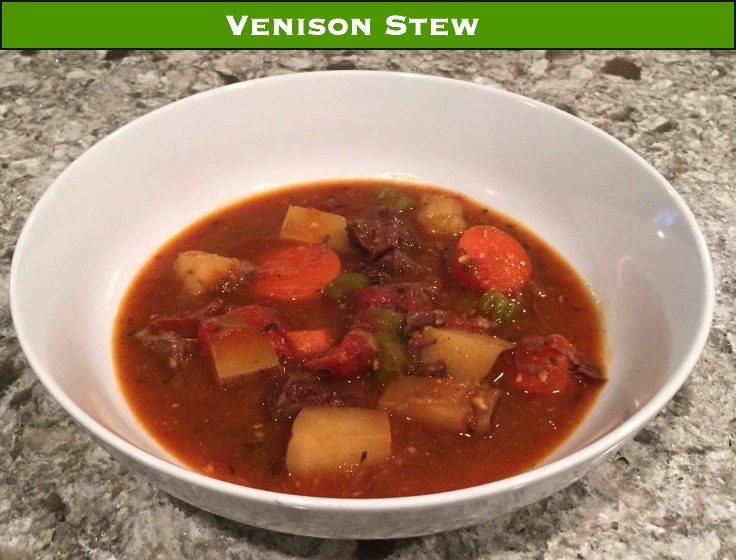 A hearty venison stew with slow cooked tender meat. 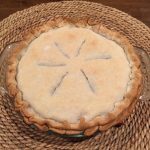 I’ve never viewed a recipe as a hard and fast rule. Then again, I’m not much of a baker. In learning how to cook venison, you will become a better chef by learning how you can twist recipes to suit your needs. 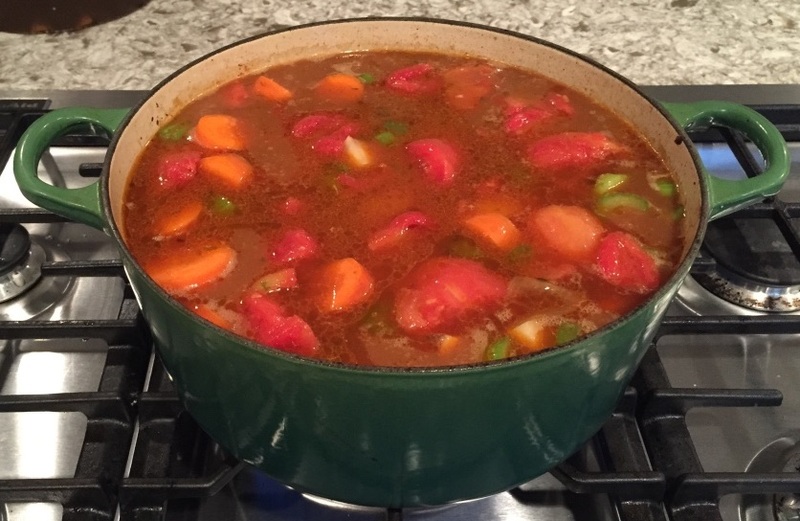 You can make this venison stew recipe exactly as I lay it out here and create an excellent meal. Or tweak it to give it a twist: use fresh tomatoes instead of canned. Use beef instead of venison (if you run out of venison that is..). This actually started out as a beef stew recipe. When I look for ways to cook venison, very seldom do I search for a “venison recipe”. Instead, I think about the cut of meat I’m cooking, and I’ll look for interesting recipes for more common meats with the same cut. This vastly increases the options. When doing this, what you need to understand is the difference between the meat in the recipe you use, and the meat you are actually cooking. 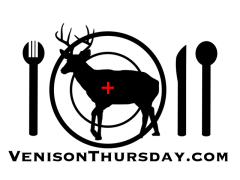 Venison is leaner than almost any other meat you will compare it to. What this means for a beef stew to venison stew conversion is: cook it a little lower, and cook it a little slower. There are no hard and fast rules here, and experience is the best teacher when trying to wing it. Though stewing is pretty easy: if the meat is still tough at 2 hours, give it more time. If the meat completely breaks down, well, you over did it, BUT hey, it will still be tasty stew! Cooking stew in a dutch oven IN the oven helps prevent scorching. 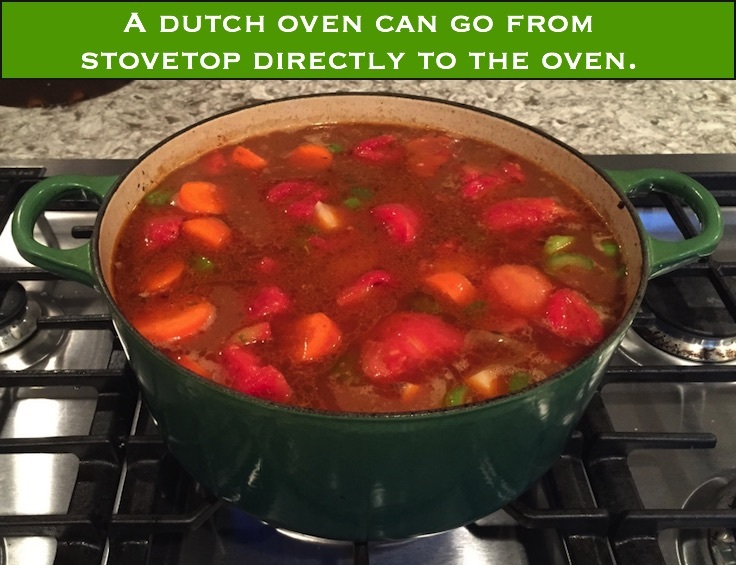 One last tip before the recipe: invest in a enameled cast iron dutch oven. You can use this for your stews, chilis, and many other things. The benefit: you can use it on the stove AND put it in the oven. For a stew, this means you can sear the meat and anything else that needs browning on the stove, and then finish it in the oven in the same pot. You’ll have fewer dishes to clean. Plus, by simmering in the oven, you avoid the chance of food burning to the pot that can happen on the stovetop. With a stew, you are slow cooking. You are letting flavors breakdown and mingle from the ingredients over a long time. If you want your meat to still be recognizable as meat, you want to select a cut that can handle that and still stay together. For stews and chilis, go with the “chuck” steaks or roasts cubed up. The chuck as they call it in beef would be the neck and shoulder cuts of a deer. 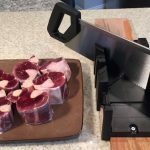 These cuts have more connective tissue and are a lot tougher than the rest of the deer, so they are the perfect candidate for a low and slow cooked stew. Generously season the venison with salt and pepper. Cover the bottom of a large dutch oven in oil and heat over medium high heat. Once the oil is hot, add half the venison, and brown all sides. Transfer the browned venison to a plate and brown the rest. Move the remaining venison to the plate once browned. If you used a lot of oil to sear the venison, you can remove some of it. 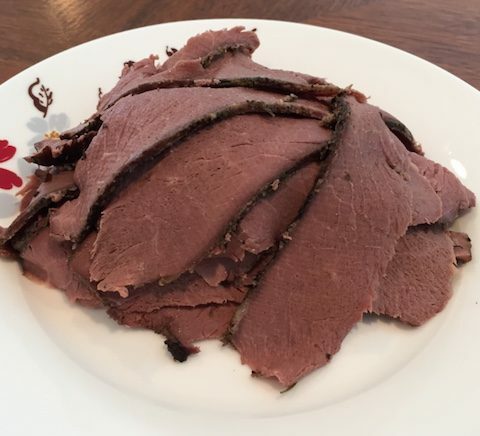 I like to leave it as it now has some nice meaty flavor, and again, venison is so lean to begin with. Add the butter to the dutch oven (venison is on the plate still). Add the onion and cook till it turns translucent. Add the garlic and tomato paste and stir till lightly browned (about 1 minute). Add the venison. Scatter the flour over everything, stir to lightly coat, and let brown, stirring occasionally. Add the broth and the spices. Bring to a simmer. Transfer the dutch oven to the oven. Cover and cook till the meat is tender, about 3 hours. 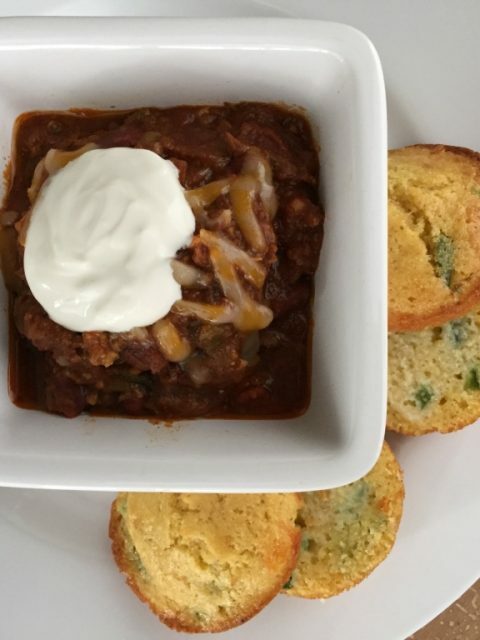 You could do this on the stove, but plan on doing a lot of stirring to prevent burning! Once the meat is tender, add the vegetables and potatoes, and cook uncovered until the vegetables are tender (about another hour).